The Lion’s Mane Jellyfish – the largest jellyfish in the world, can grow up to 2.5 meters in diameter, and contain 30 meter long tentacles. See why they can be so “irritating”. 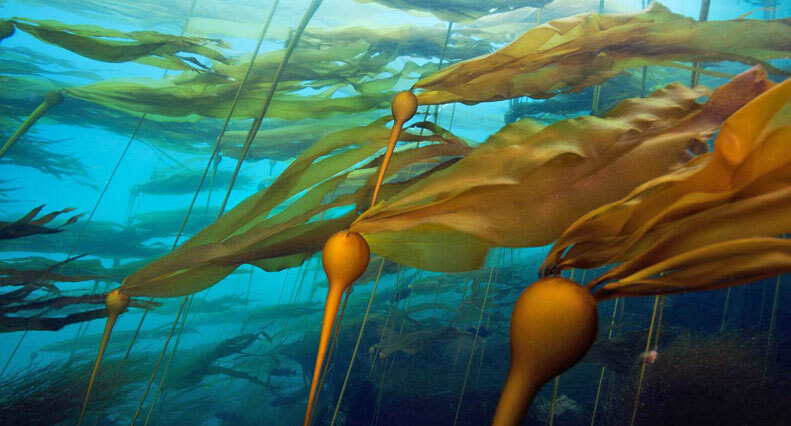 Bull Kelp is a type of brown algae, which happens to be the fastest growing organism in the world. Bull Kelp forms massive kelp forests that are used by dozens of species from sea urchins and fish to seals, sea lions and whales. Bull Kelp stalks are long, smooth tubes that can look like snakes or tree branches in the water. The stalks can grow to 20m (65 feet) long in a single year. 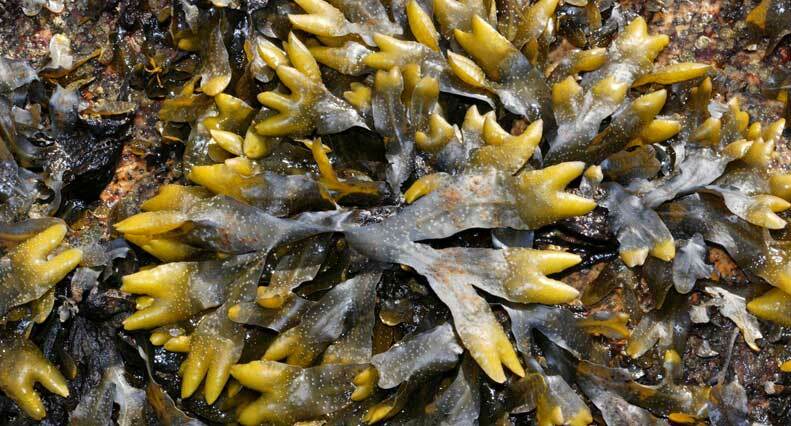 At the top of the seaweed is a large bulb-like structure where the fronds (parallel to a plantʼs leaves) grow from. The stalk of Bull Kelp is hollow and filled with carbon monoxide gas. By winter this kelp has died, being released from its holdfast on the bottom of the ocean. It washes up on beaches where it provides essential food and habitat for many small creatures including purple shore crabs and amphipods. Bull Kelp is edible when it is young and green, many people make it into a relish, pickle it, or eat it raw. Historically it was used by natives to weave baskets or carry water and other liquids. Rockweed is a species of green algae that grows in intertidal areas on rocks. Its colour ranges from dark green, brown or even dark yellow. It is a short seaweed with forked tips. During the spawning season, the tips are swollen and bumpy, full of eggs and sperm. Rockweed is slimy to the touch, an adaptation to prevent drying out when the algae is exposed at low tide. Many organisms hide under Rockweed to evade predators and also to avoid desiccation during low tide. Look amongst Rockweed and you will find hundreds of snails, limpets, amphipods, sea urchins and sea stars. The Lionʼs Mane Jellyfish is the largest jellyfish in the world with a wide, round bell which appears flat on top. Their colour ranges from orange-brown to dark brown with pink and translucent spots. Their bell on average can reach a diameter of 2.5 m and its tentacles can extend over 30m. The largest Lionʼs Mane Jellyfish ever found in the world measured 37m (120 feet) long, making it the longest species in the world! Their size is staggering because these animals only live for one year! Stinging cells called nematocysts are found on the tentacles, and are used to paralyze passing prey. Their sting is not known to be fatal to humans, usually only causing an irritating rash. Lionʼs Mane Jellies live in temperate to Arctic waters, and cannot survive in warm ocean areas. Moon Jellies are a small species of jellyfish that you can hold in the palm of your hand. They are translucent with a gray-blue hue. They are very easy to identify because of their 4 horse-shoe shaped gonads (reproductive organs) on the top of their bell. They have many short tentacles that contain nematocysts which are stinging cells used to capture food, but do not sting humans. 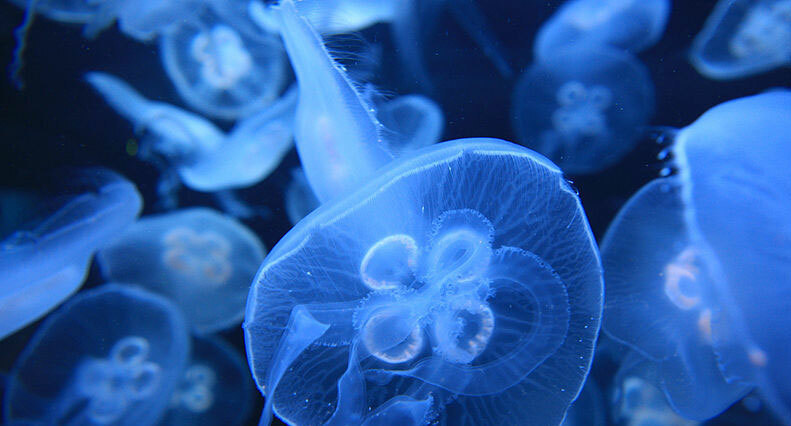 Moon Jellyfish are found from Alaska to California in coastal areas. Like most species of jellyfish, they only live for one year. Sea Nettles are seen off Victoriaʼs coast during the summer and fall, with massive blooms of these beautiful jellyfish dotting the waters everywhere. Their bell is a golden yellow colour with crimson red edges and tentacles. They also have 4 feeding arms that extend from the bell and are white in colour. Nematocysts or stinging cells are found on both the tentacles and the feeding arms, which the jellyfish inject into prey and paralyze them before being consumed. 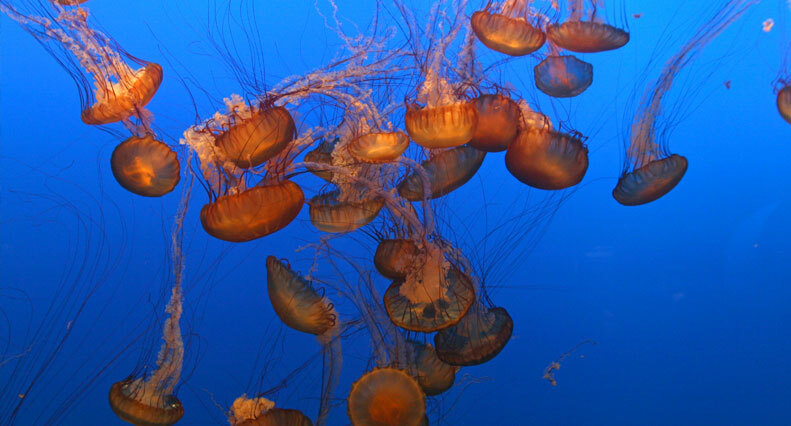 Sea Nettles grow to about 6-8 inches in diameter, with tentacles and arms stretching out several feet. They can cause a moderate to severe sting in humans. Some people will have an allergic reaction to their sting, which can be fatal. 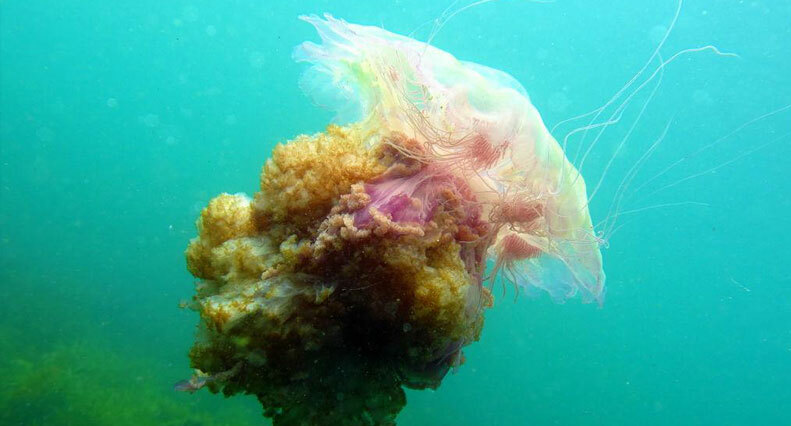 They are one of the most beautiful jellyfish found in the coastal waters of British Columbia. Ochre sea stars are abundant in the North Pacific, inhabiting rocky intertidal areas. They are brightly coloured sea stars, ranging from many shades of orange to many shades of purple. All ochre sea stars have calcareous spines on their aboral (top) surface and have five arms. The possible advantages of one colour over the other have been heavily studied for this species, but neither prove to be more or less advantageous when it comes to their survival. 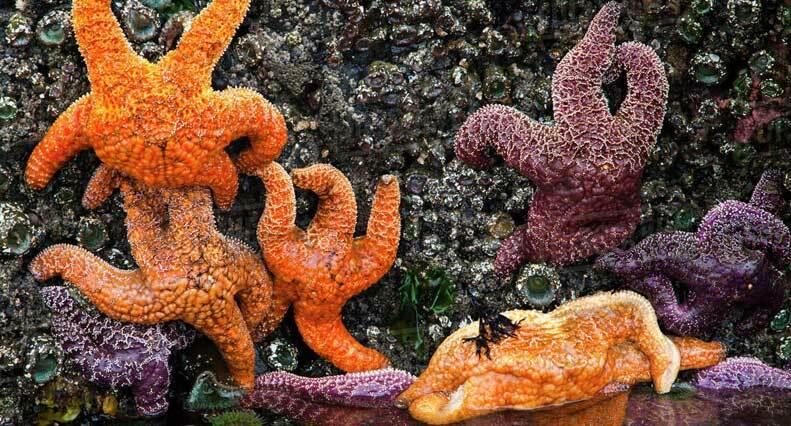 Ochre sea stars feed on bivalves, limpets and barnacles. They can live for over 20 years, growing to impressive sizes. 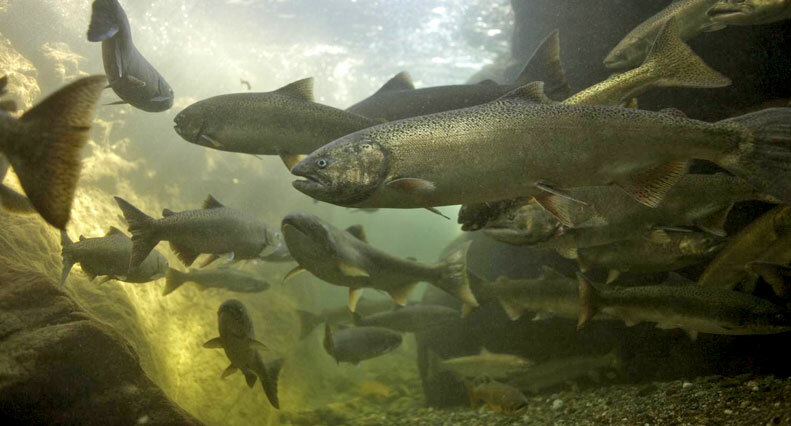 Chinook are also known as King salmon, and are the largest species of Pacific salmon, averaging 10 to 30 pounds. The world record Chinook salmon weighed 126 pounds (57.27kg)! Chinook attain massive body weights by eating other fish. They are also the primary food source for both the Northern and Southern Resident Killer Whale populations, making up approximately 76% of their diet each year. Chinook salmon will spend 2 to 7 years in the ocean growing in size before they head to freshwater rivers to spawn and then die. The Fraser River near Vancouver is the largest spawning river for salmon on British Columbiaʼs coastline. Being the largest species of salmon, they are a major target for the commercial and sport fishing industries. With so much pressure on the species, coupled with environmental degradation and pollution, the population of Chinook salmon has experienced alarming declines over the past 100 years.